I commonly swipe downward from the top of my iPhone screen to listen to Siri read the page displayed (enabled under Settings / General / Accessibility / Speech / Speak Selection), or I tap-hold and highlight text then choose "speak" from the contextual pop-up menu (enabled under Settings / General / Accessibility / Speech / Speak Screen). 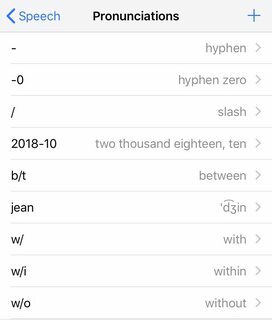 "2018-10-19" (ISO-8601 date format) should be spoken as "two thousand eighteen, ten, nineteen", not "two thousand and eighteen to two thousand and ten minus nineteen". "w/" should be spoken as "with" (or at least as "double-u slash") not simply as "double-u". "/" should be spoken as "slash", not simply ignored.
" ---" should be "horizontal break" or "triple-hyphen" or anything, not simply ignored. "jean" should be spoken as the English noun "jean", not the French forename "Jean". I've tried adding rules to Settings / General / Accessibility / Speech / Pronunciations, to no effect (even after quitting all apps and rebooting). Browse other questions tagged ios siri accessibility text-to-speech . How to to specify pronunciations for OS X Lion? Continuity not supported to / from my iPad? How to make a Mac speak out system notifications? Can I use Siri on my iPhone without having to speak?